This week I am answering four questions that have arisen during the abnormally wet and stormy weather that many of us have experienced over the past few months. Q1. Due to sand erosion and/or flooding a Committee has defined an entire bunker as ground under repair. What is the reference point for taking relief? A1. First, it should be noted that Committees should not take a bunker out of play just because it is expected that there will be casual water lying in it throughout the competition. The Rules of Golf anticipate casual water in bunkers and offer three relief options (see this earlier blog of mine, Casual Water in Bunkers). However, when a bunker has been declared ground under repair, it loses its status as a hazard and is automatically classified as ‘through the green’. The relief is then the same as taking relief from any other abnormal ground condition under Rule 25–1b(i), and so, providing the ball is found, the reference point is the nearest point from where the ball lies in the bunker. If the ball is not found, but is known or virtually certain to be in the bunker, the reference point is the nearest point from where the ball crossed the margin of the bunker, as in Rule 25-1c. Q2. 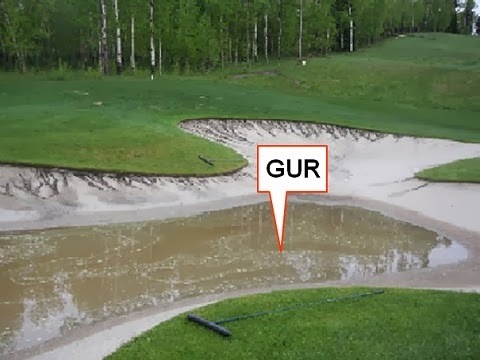 Following weeks of above average rainfall there were occasions when a pond on the course overflowed outside of the hazard stakes defining its margin. Is the overflow casual water? A2. Yes. Any overflow of water from a water hazard which is outside the margin of the hazard is casual water. Decision 25/2. Q3. In order to protect the weather ravaged putting greens, a Committee was forced to use temporary greens cut on the fairway approaches. They introduced a Local Rule permitting players whose balls were on the temporary putting green of the hole in play, to pick-up their ball and add two strokes to their score. Is this permitted? A3. No, Decision 33-8/1 confirms that any Local Rule under which a player in a stroke play competition would not be required to hole out waives Rule 1-1 and is not permitted. Q4. Whilst preparing to drive their ball on a links course running along by the sea, a player notices that his teed ball is oscillating in the gale force cross-wind that is blowing. He asks his two fellow competitors to stand to the side of him and his ball as protection from the gusts of wind. Is this permitted? A4. No. Accepting protection from the wind from the fellow competitors would be a breach of Rule 14-2a, which states that a player must not make a stroke while accepting physical assistance or protection from the elements. There are 999 similar questions, answers and references in my eBook, ‘999 Updated Questions on the Rules of Golf 2012 – 2015’, which costs less that $10.